When I switched from HollowBites to Twombolts, my ankles thought they died and went to heaven. No more ankle bite! How much heavier are current Thunderbolts than v1 Wombolts? They were beefed up in comparison? I still have the original Wombolts and can remember thinking they were scary light taking them out of the box, they're also to this day not broken. Yeah, I was trying to figure out exactly what problem those slits would cause.... and I'm guessing "torsion." The force of cranks on a spindle is to twist the spindle in opposite directions. . . . . I truely think that's a fine concept to get more tightness and get rid of wobbling, at least for the half of spindle boss of the crank. I didn't buy them or anything, I still have my old Powerbites, I just had a discussion with someone and wanted to check what exactly was the problem of those complete bikes. I just checked other photos of those cranks and noticed they have three slits, not two as i thought, so rotating the slits 90 degrees won't really solve the issue. That photo above didn't show them clearly. Thats the case with all cranks when they are still new. Those arms look nice with that transparent green though. It seems that it is the case, but only for half the splines lenght. Isn't the goal to push the spindle and spindle boss splines against each others to increase grip using some sort of conic stuff inside? I might be quick to conclude. 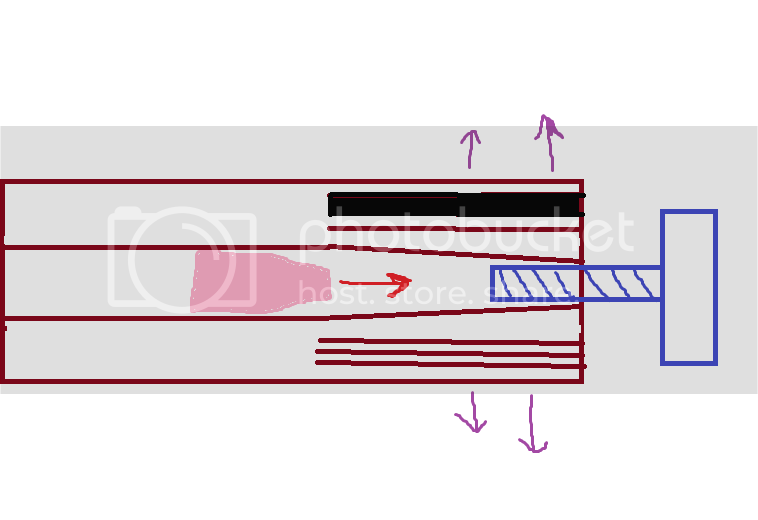 instead of screwing into the spindle itself, the end bolt (blue) screws into the wedge shaped bit (pink). the inside of teh axle is hollow, and tapers in slightly towards the end where the bolt lives. cos of the slots, when you tighten the end bolt the wedge is pulled towards it which splays the ends of the spindle out slightly ensuring a tighter fit on the arm, eliminating any wobble. im sure i read back when they first promoed the design on like the merged or somewhere that the whole point of this was so the arm could slide on and off easily when the wedge was loose but would stay tight when done up. These are a 2pc 22mm crank using our new ESS (Expanding Spline System) making them incredibly strong, yet super easy to install and remove. No more taking a hammer to your cranks ever again. Yeah that paint shows it clearly now. So to increase gripping, the bolt needs to be tight enough, and to avoid the end of spindle to expand (wich theorically may result the spindle boss to deform too, but this need to be revised considering if the materials used can withstand the tolerences to spring back or not) it desnt need to be overtightened. plus the pressure on the bolt must be constantly in check.